January 31, 2018, ©. 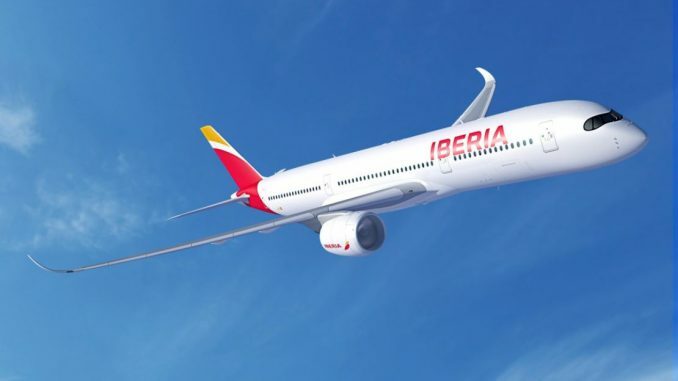 Leeham Co: IBERIA will be the first airline to get the upgraded Airbus A350-900. The airline presented the news at the Fitur 2018 International Tourism Trade Fair in Madrid. The airline’s first A350-900, delivered in June, will be the first A350-900 featuring the aerodynamic improvements we presented in October. The parent group of IBERIA, IAG, ordered both A350-900 and -1000. The 18 A350-1000 were ordered for British Airways to replace Boeing 747s and presumably ageing Boeing 777-200ERs and -300ERs going forward. The A350-900 is no alternative for British Airways, as it operates a sizable fleet of Boeing 787s. The common pilot type rating makes the 787 an attractive complement to the existing 777 fleet for British Airways. IBERIA, on the other hand, operates no Boeing aircraft. Its Pilots are all trained and certified for Airbus aircraft. The A350-900, therefore, makes sense as a replacement for the A340-600 and probably some A330-300s. Dependent on route development, the order of 16 A350-900s could see some aircraft convert to the larger A350-1000 at the end of the deliveries, which are programmed for 2021. IBERIA will receive its first A350-900 in June. Once the aircraft has done the airline familiarization, it will be put on the first long-haul route between Madrid and JFK. IBERIA will get a second A350-900 later in 2018, followed by another 14 until 2021. IBERIA will be the first airline to receive the new version of the A350-900, incorporating several improvements. The aircraft includes aerodynamic improvements, among them the new higher winglets we announced in October, Figure 1. Figure 1. Airbus test A350-900 with the new, larger, Sharklets (top aircraft). The present production version is shown below. Source: JuJug Spotting. Airbus discovered during flight test of the A350-900, the pressure distribution of the wing could be further improved. The way to do this is to change the spanwise twist distribution of the wing. This requires a change of the wing production tools and a limited flight test campaign to verify the changes don’t change anything in the characteristics of the aircraft. With a change in the wing’s tooling and the following limited flight test, the chance opened to do other changes to further improve the performance of the A350. Airbus decided to use the margin in the wing’s strength, found during static load testing, to increase the size of the aircraft’s winglets. This together with an adapted twist of the wing will reduce the aircraft’s induced drag. The aircraft also incorporates structural improvements, lowering the empty weight of the aircraft. In total, the changes improve the fuel consumption of the A350-900 by 1%. The improved aerodynamics also means a range improvement of 100nm. For the IBERIA 280t version of the A350-900, this means a range of 8,200nm when flying with a 3-class cabin of 325 passengers. Was this aerodynamic clean-up (minus the big winglets) part of the A350-900ULR ? Any favorable side effect on take off and landing performances ? Any details on structural clean up besides CFRP door surrounding ? I’m sure it paves the way for the -900ULR and possibly Qantas’ desired SYD-JFK/LHR superbird. My question is will the 350-1000 also get the twist? An 359 with 35K wing, bogeys, engines and 310-320 MTOW would surely do 10KNm with 280-300 pax? IMU the -900 twist change is a backport from the -1000 ? Thanks, will be interesting to find out. So young and already getting updates… Great news, great development method. Do we know anymore about the ULR and seat count… That is… Can it ‘go-long’ with a normalized cabin… Or are there still reductions needed in cabin density? Could a -1000ULR be offered? Backporting tech advances imho is a good idea. Not getting overambitious on the initial model was afaics instrumental to a perfect EIS. Creating a gulf like the 788 789 “noncommonality” presents as a distinct downside. The perfect EIS that was a year late? If I recall correctly, more like 2 years late. Doesn’t take away from near “perfect”. no need to answer, Rick. Easy for Airbus to have commonality between the A359 and a A358 that doesn’t exist and never will. A rushed design leads to poor design and has a direct relationship to the number of testing issues encountered. They both lead to production issues, which are much more expensive to fix. In contrast to the 787 tech mess and hugely expensive production issues, Airbus stretched out the development period of the A350 in order to avoid having to have to deal with expensive tech issues on production aircraft. That’s why break-even on the A350 is within Reach, whereas the situation for the 787 is not at all comforting. Now tell us which programme — 787 or A350 — that was developed using astute scheduling. It seems Airbus is planning to increase the MTOW of the A350-1000 from the planned 308t up to 316t. fin at 316t or is there more in the chute? nice feature to see MTOW expansion while OEW is constant or decreases. Or is it bringing the A350-“8000” closer to reality. With XWB-EP’s there is apparently a thrust increase possible. An 350-8000 don’t need serious range (35K-ULR territory), 6500-7000Nm will most likely be what many will be happy with? What would be the range of that 316t -1000? Wonderful. Let’s see what haoievs when all those 777-200 and 777-300’s need replacement. I think the A350 will be the winner. It is possible that as the range of the current -1000 is increased, it will show room for a stretch. Airbus always has cards under their sleeves and it is likely that they already know it will outperform the 777-9. The 777 replacement should be interesting to watch. Boeing has ceded that area, unless you want to consider the 787-10 for the shorter missions. How that plays out with the 777-9 market dynamic will be quite fascination. 787-10 is suitable for 90% of missions. Totally agree, OEM’s especially AB seemed to have been possessed with range. There is a requirement for 7500+ Nm range wide bodies but AB needs a shorter range optimized A350X with max range of 6000-7000Nm. The 787-10’s range is around 6500Nm, the 773ER quoted range is ~7400 while projected range of the 777-9 around 7600Nm. AB could do some magic with 3.5m stretched 359’s and 35K’s with more seat capacity and less range than the current 8000+Nm aircraft but even better seat mile costs. Have the OEMs been too aggressive on range? 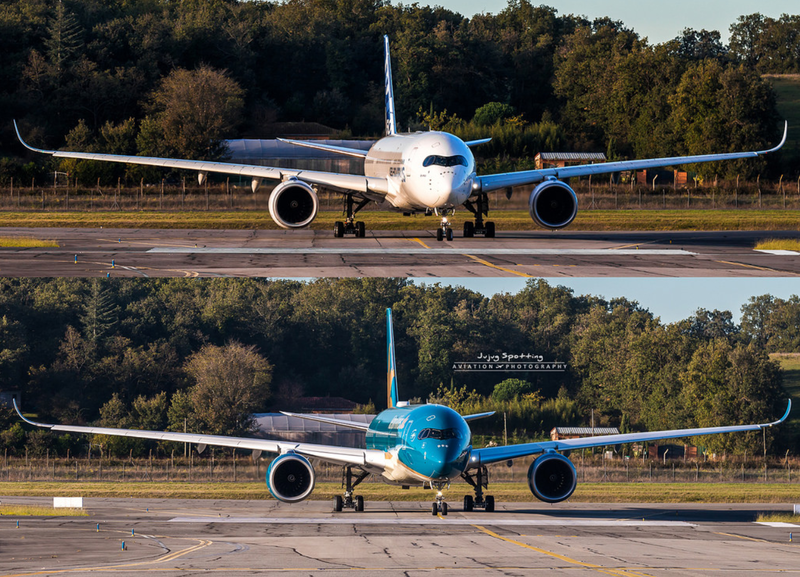 There must be considerable scope to offer a less capable but more efficient alternative B787-10 vs A350-900. The question here us whether Airbus will offer the extended bulkhead that was mooted to emirates to a wider audience? If they do then these two aircraft have almost equal efficiency but with the Airbus being more capable. Presumably then it comes down to negotiated price. Don’t get me wrong the B787-10 has scope to hurt the A350-900 or at least keep the pricing honest. The 777-9 won’t enter flight testing until 2019. With its exact performance level still unknown to even Boeing, I’m not sure Airbus knows that the A350 will outperform it. The engine is heavier but expected to be more fuel efficient. Tweaking the spanwise twist distribution of the wing is a fairly fundamental aerodynamic change and not merely a clean up even if it doesn’t require a fundamental structural change. The fact that the initial A350 wing design left 1% fuel burn on the table illustrates how complicated modern aircraft design really is and how hard it is to get things exactly right the first time. Total induced drag is not just about the wing (although it mostly is) but is also affected by the lift (or anti-lift) from the fuselage and empennage. With commercial aircraft everything is interconnected (aero, structures, controls, systems, etc.) and must be carefully considered and is always subject to trade-off. 1% is worth going after. The amount of changes to the 787 and A350 over the first 100 or so airframes makes me very suspicious about the development of the C series. Particularly the production side. Although,if this is the normal state of affairs,any competitors will have to go through the same thing. Airbus has twisted the A330 and A350 wings and wants to twist the A380.Have they found something new?How much would a new a320 wing give if you can get 1% out of a brand new one? Most modern jetliners (all?) have wings with variable twist distribution along the span. Tiwst distribution has a direct effect on how the lift is distributed along the wing. Eventually, if the wing is flexible enough, the twist distribution may change under the aerodynamic loads (aeroelasticity). Now one key aspect for choosing the right twist distribution for your wing is the trade-off between aerodynamic performances and loads. A good twist distribution for lowering your wing loads will give you a span-wise lift distribution with a “bell shape”. A good twist distribution for improving the aerodynamic performance will give you an elliptical lift distribution. So basically, optimal aerodynamic performance comes at the price of a slightly higher wing weight, and vice versa. This has direct impact on the airline economic, and is chosen based on the routes the aircraft may fly. This is the trade-off (among other things) that Airbus would have to solve if they wanted to re-twist the A320 wings. My guess is that there isn’t too much more to get out of the current A320neo wing, at least that would give a good return, because Airbus just got done tweaking the induced drag of the by switching to sharklets. During that process they must’ve reviewed the spanwise twist profile. Not sure if twist changes were actually needed and made or not. We’re talking here about tweaking the spanwise twist profile here. Neither Grubbie or I have mentioned anything about increasing the wingspan. Also, as far a I know, the neo sharklets don’t change the gate class of the A320neo. those would require more wingspan. Doesn’t the A320neo have sharklets instead of the smaller fence-like wingtip devices on the A320ceo? And, doesn’t the A320neo have the same gate classification as the A320ceo? I had read that as your wish to switch to the A350 type wingdings. that then clears the mis-understading. That should read Airbus has twisted the A380, A330 and A350 wings. The A380 wing was retwisted some years ago to gain further optimisation of its aerodynamics. Any idea if that is just a change for the jigs or does it change all involved parts? i.e. is this a cheap change or a very expensive one? The current current A380 wing is unchanged. Its the so called 380Plus that has outer wing retwist. The A380 wing was changed in 2012/13 ( .5° twist change, 15t MTOW increase ) just ahead of the first BA delivery. @dukofurl, I knew I had read that somewhere!But I also have the feeling now that Bjorn is right as well,Airbus are retwisting mad. The extremely complex wing of the Spitfire also famously has a twist designed in to give combat pilots the ability to have control at the edge of the envelope. I don’t think that other aircraft of the time used it. I might see if I can look at one tomorrow. 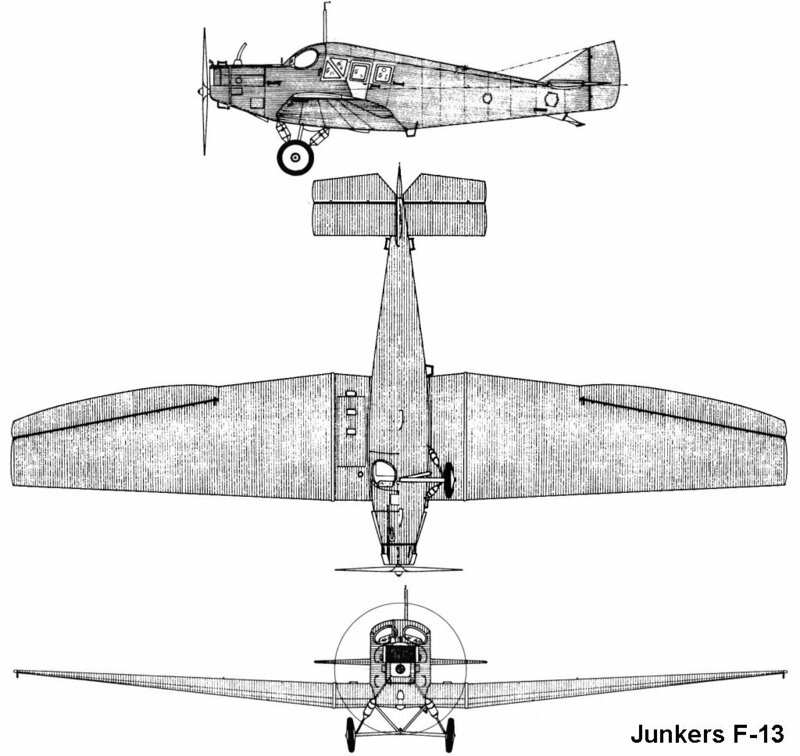 Junkers F13 1919. imu the Junkers J1 some years earlier too. @uwe,another myth dies.Reading about this,It seems that the wing’s main designer Shenstone spent some time in Germany and the wings design may have been influenced by Prandtl.Don’t give your ideas away to your future enemies! The twist change is within the capability of adjustments to the jigs in my recollection. It will require a period of careful measurement and checks the finished wing has the desired new twist. But a change in twist affects the stall characteristics of the wing. So you need to verify everything is Ok in the big wind tunnel. Bjorn was the 330CEO’s wing already twisted or is only introduced with the NEO? In quiet the 321LR made its first flight yesterday. Not sure if a twist of the 321 wing and adding A380Plus-like winglets are possible? If such improvements are possible plus the projected SFC improvements of the 2nd generation PW1100G’s the 321LR could become an interesting aircraft. Improvements to the 359 wing could make a stretch of the 359 by 3 or 4 rows (~70m) a plausible option for airlines that need more capacity and less range (6000-7000Nm) using XWB84-EP’s. It seems to be a classic IAG play to wait for the upgraded model, they did the same with the A380. Presumably this has significant benefits not only of efficiency and performance but also way down the track on disposal. So Iberia is getting the 280 tons version? Below link to A350 production list. Aircraft #216 to SIA, 1st ULR. #219 Iberia, 1st wit “acc” winglets. No mention of ULR but possible if they want it? The 350 could over the years develop as a very competent aircraft family ranging from 280 seats (350-800) to 380 seats (350-8000) that could serve airline requirements well.